When you are racing against time or facing new technical challenges, quickly and conveniently strengthen your internal engineering resources with our expertise & capacity. We also undertake gap analysis to identify where your in-house simulation, reliability & safety strategies can be enhanced through appropriate technology and consulting solutions. We are committed to improving clients’ products and processes through engineering software and training whenever appropriate. However, we also realise that you may require help when you do not have the resources, budget or mid-term requirement for in-house capability. Since 1980, we have provided consultancy to most engineering sectors, from single projects to long term service relationships exceeding 20 years. We can offer you much more than a simple yes/no on whether your design, process or strategy is working well. Through our team of Chartered Engineers, we can generate insight, fresh ideas and potential solutions through experience, engineering knowledge, advanced analysis technologies and evolving optimisation methodologies. This ranges from design guidance on machined & welded structures and support when developing products with 3D printing and other advanced manufacturing processes, through to specialist expertise on sealing & tribology and mentoring on design-for-reliability improvement programmes. Our focus is on solving your problems rather than selling a specific service. We can bring together our design simulation, process modelling, reliability analysis and safety consulting capabilities as appropriate.We also undertake ‘traditional’ hand calculations, spreadsheets and desktop studies when it makes sense. Simply contact us by email or phone for an informal, no-obligation discussion of your requirements. From an initial phone call we can often give you an idea of price and time scales. With subsequent details, we can then send you some solution ideas, scopes of work and a formal quotation. Wilde supported our business to provide accurate and reliable data. Our material library was using data without easily accessible sources. Wilde helped us to update and confirm these numbers with up-to-date industry information. Communication with Wilde was easy and hassle free. All of our questions were answered either instantly or after a short period of review. Now we can back up our study results, to our customers, with internationally recognised data. A truly professional service. The advice you gave me on extracting radial stresses using paths was precisely the information I needed and the fact you provided screen dumps of the actions needed, so I knew exactly where to look, was excellent. We have worked closely with the very professional and knowledgeable team at Wilde for many years now. 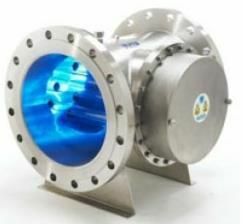 They have recently provided detailed analysis and technical support in connection with our latest high pressure wave ring sealing project. This has enabled our client to make modifications that will reduce VOC emissions and improve safety in certain operating scenarios, ensuring that our client was extremely pleased with the service we provided. The knowledge and experience of the team helped steer us down a path where we would get better use from the data we had, and provide us with a workable plan going forward. Excellent collaboration between both parties ensured that we learnt a lot that we can take forward as best practice in the way we carry out further analysis of other systems. The work carried out has been beneficial at a micro level, however, as we roll it out to the wider business I am sure that it will prove a useful tool an method to understand the reliability of the system and how we best manage the maintenance requirements going forward. For our product to be viable and successful, we had to make sure it could perform how we expected it to perform. That’s where analysis and strength testing was vitally important. Wilde Analysis provided an excellent service delivering the results in a truly professional manner and worked with us through various iterations of the product. A very knowledgeable and highly recommended company. Virtual testing by Wilde Analysis gave us peace of mind and allowed us to confidently present the initial concept, safe in the knowledge that it would perform as we expected it to. The results were presented in a clear, concise format that was easy to understand. This project was for a detector system designed & manufactured by Photek Ltd. to be part of an orbiting satellite. We had to meet stringent vibration & shock requirements which meant producing a test fixture to mount on our vibration test machine... We submitted our design to Wilde who supplied us with data showing several areas which required strengthening in order to meet the specification. During this process, Wilde maintained good communication... to ensure that their suggestions were in line with our requirements. Without this input from Wilde, it is likely that our testing would have been compromised. After design modification, the fixture was made & testing completed to our customer’s satisfaction. Wilde was very good in assisting us with the transfer of the knowledge required. It was a good partnership in respect to the work undertaken: Wilde not only helped us to gain knowledge but also an understanding of the reasons why, which we were very happy with. The engineering team at Wilde Analysis provided a prompt and efficient response to our requirements, ensuring a very quick delivery and ultimately strengthening our relationship with our end client. Although this was the first time that we have used a consultancy for Moldflow analysis, the expertise supplied was exceptional and gave us a high level of confidence in the results. From the analysis we had a head start in the design process before manufacture, saving money and time. We were kept well informed throughout by very approachable engineers: the results were presented simply without complication, providing us with a greater understanding. The team of expert engineers at Wilde Analysis helped us understand the fluid flow in a novel cell chamber used to remove DMSO at the point of care. The rigor Wilde applied to our fluid problem and the relationship that was developed was great. The excellent FEA and CFD Technical support that I received from the expert team of Wilde Analysis Engineers gave me confidence with my designs & allowed us to proceed with development & manufacture. It is a hugely beneficial extension to our technical capabilities for a small Engineering company. The Consulting Analysis that Wilde supplies to our business from their expert engineering team is fantastic and gives us confidence in the services we provide, safe in the knowledge that we can deliver on time and within budget. The consultancy that Wilde provided for us proved highly beneficial because at tender stage it highlighted a discrepancy that we had ourselves anticipated. We were therefore proven to be correct. The main driver for us is speed of delivery not cost. Wilde Analysis gave us expert advice in a very tight time frame. This meant that we had confidence to move forward quickly with the reworked design and potentially make massive savings in our tooling process. Wilde gave us exactly what we were looking for. Their consultancy service confirmed some of the assumptions we were making and added value to the report to our client. It also increased our level of confidence in the recommendations we made to our client. This was a unique project for the client and for us. We required Wilde’s help and are very happy with the outcome. Wilde’s engineers also provided us with knowledgeable advice and recommendations to improve our design work; there have been no issues with the fabrication and installation and we have found Wilde’s engineers very helpful throughout our design development and the client’s approval process. ... While the wind report was needed for planning, it was also very important to us to ensure that the design factored in the wind analysis to promote people’s comfort and safety within this development. This is an important factor which is too often slightly overlooked at early stages of planning and design. On completion of the design, Wilde, being a preferred partner of Parkburn, was enlisted to carry out independent verification. After specifying the design requirements and objectives of the analysis, Parkburn can rely on Wilde to provide reliable results in a presentable format ready for review by design approval agencies. 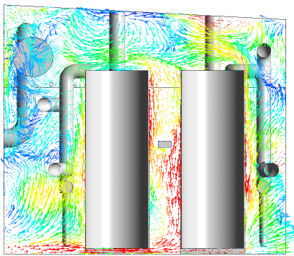 IAC and Wilde Analysis have been working together for several years now, and we at IAC know that our CFD and FEA work is in safe hands. The intuitive way the work is completed means IAC engineers can be confident of high-quality results delivered by Wilde on schedule. The work completed by Wilde has been invaluable in enabling us to design and build an optimised solution for clearing ice and snow with gusto. The computer modelling and subsequent report was very thorough offering options for alternative design. The consultancy project enabled us to spot errors that would have cost much more than the sum of the analysis itself. It enabled us to see things before we committed to them which is very beneficial, especially in terms of the high financial investment involved in the design of the larger components. It made sense to us to analyse these high value components, as the cost of modifying the tooling is so high. For us, the advantage of using Wilde’s consultancy services is that we can give our client confidence in the results that we present to them. We were very impressed with how well the process went. Compared to our previous experience of product development / FEA with a prior company, we felt that the process with Wilde was much faster, with results expertly presented and proven to be accurate. The job was delivered on time with a very proactive approach from their engineers. Subsequent tests on the machine have proven the model to be accurate and allowed the design to develop. Wilde’s consultancy work has answered many of our questions and cut down significantly on our testing time – fewer iterations mean less costs to us which has to be beneficial. ... Willerby has worked closely with Wilde Analysis on new product development. The work has included in depth FEA and part optimisation studies relating to new product developments.... The work has resulted in excellent opportunities to reduce component part count and material content. Due to the success of this partnership, it is highly likely that further studies will be conducted between the two organisations going forward. We are very happy with the service that Wilde provided. Their consultancy work for us offered us peace of mind that investment on our part in tooling is worthwhile and meets the functional brief. [Wilde engineer] attended site to get an appreciation of SSE’s business at Smurfit...... was professional in getting the information at the site and has spent time on the computer system to follow up on this. [He] is giving me peace of mind in the fact that if anything goes wrong we will have the information to hand to back up all our safety systems in one location – the safety file. The particular assembly that was evaluated is fitted into what we would consider to be a severe application. 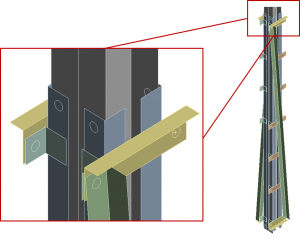 The study based on the FE analysis results demonstrated that there were no areas that are significantly highly stressed which in turn gives confidence with similar designs fitted to less demanding applications. The study that Wilde performed for us gives us confidence to look for similar type of assistance in the future. I was very satisfied with the end result and manner of analysis Wilde carried out for us, their input was invaluable to the project design review, they played a major part in obtaining our goal. Wilde Analysis achieved everything that we asked of them, within the required timescale. The results were presented exactly as requested and we’re very pleased with the outcome. I in particular found the briefing informative and your report was excellent in terms of depth, analysis and presentation.